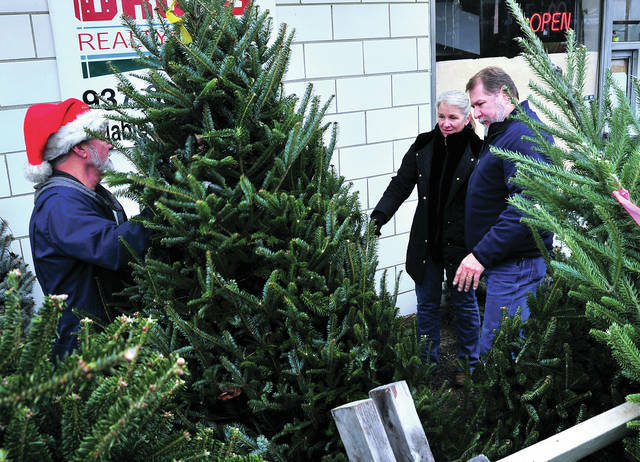 Mike Ullery | Daily Call Terry and Renee Waag of Covington select their 2018 Christmas tree at George’s Dairy Bar tree lot on Friday. George’s is one of a variety of local places to purchase live Christmas trees. MIAMI COUNTY — ‘Tis the season for chestnuts roasting on an open fire, yuletide carols, colorful decorations — and of course, Christmas trees. Live Christmas trees are more popular than ever and Miami County has a number of places for families to choose their own perfect tree. The Miami Valley Today turned to Facebook to ask readers where they suggest finding the tree of their dreams. For those wishing to purchase a pre-cut tree, our readers suggested Kroger, Lowe’s, and George’s Dairy Bar in Piqua. Live Christmas trees are beautiful and add a wonderful aroma to make your season bright, but with lives trees come safety concerns. Captain Tim Risner of the Piqua Fire Department offers some suggestions in placing an caring for a live tree. •Keep your tree holder filled with fresh water. •Avoid placing your tree near any heat source. •Use only Underwriters Laboratories-approved lights. •Make sure to turn off tree lights before going to bed or leaving your home. • When choosing your tree, look for one that is fresh. https://www.dailycall.com/wp-content/uploads/sites/30/2018/12/web1_113018mju_georges_ChristmasTreeLot-1.jpgMike Ullery | Daily Call Terry and Renee Waag of Covington select their 2018 Christmas tree at George’s Dairy Bar tree lot on Friday. George’s is one of a variety of local places to purchase live Christmas trees.